Born April 13, 1954 in Philadelphia, USA. 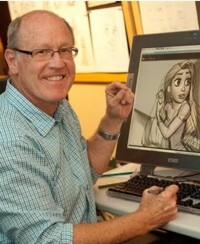 He is an animator, author and illustrator famous for his work at Walt Disney Animation Studios. Son of the cartoonist Bil Keane, his destiny was already written since childhood, observing his father's work. After graduating from college, Glen arrives at the California Institute of the Arts with a college scholarship from another college. His application for registration was, among other things, randomly sent to the Experimental Animation Program led by Jules Engel (mentor of several generations of animators, he collaborated with Disney for the masterpiece "Fantasia"). In Disney since 1974, Keane has put his signature on some of the most beloved classics such as The Little Mermaid, Beauty and the Beast, Pocahontas, Aladdin, Tarzan, Rapunzel and many others. The quality of his work is universally recognized as sublime in the field of traditional animation. He has received numerous awards all over the world and continues to inspire animators of all ages.